Dear God, we bring before you MLA Wab Kinew. Thank you for the blessing of leadership qualities and abilities that you have given him and we pray that they will continue to be used for the good of all people in Manitoba. Thank you for his work on social justice issues, and for his compassion for those who are vulnerable and need a voice. Give him strength and guidance as he works on tough issues that face our province and the people of our province. We pray a special blessing on his wife and children as they support him in this important role of serving the people of Manitoba. Cover them with Your grace and mercy. In Jesus’ name we pray. 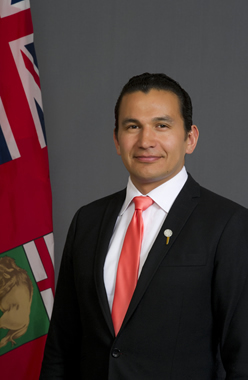 Amen……..
Wab Kinew is the Leader of the Manitoba New Democratic Party and Leader of the Opposition. Before entering politics, he was a musician, broadcaster and university administrator, best known as a host of programming on CBC Radio an CBC Television. Kinew is married to Lisa, a family physician who practices medicine at an inner-city clinic, and has two sons from a previous relationship.